She checks over her shoulders, twice, before pulling two small parcels out of the large black bag with gold lettering. 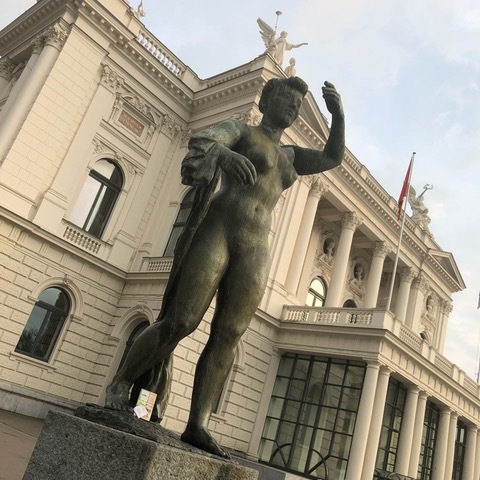 It is a mild May evening in Zürich. The sun bathes the smooth quartzite of the Sechseläutenplatz in a soft caramel yellow. People are scattered all over this public space, soaking in the rays, sipping espresso in nearby café Schiller or idly chatting with their peers on the opera house steps. We stop and look up at the opera house, steeped in rich traditions. its pristine façade proudly watching over this square. The national circus is here now and occupying a lot of the space. Four bulky letters at the pinnacle of the vast white tent stake its territory. Behind it, meticulously arranged—this is Switzerland, after all—dozens of wagons and stalls form their own small world. This is where the circus menagerie has its temporary home. The air is filled with the scent and sound of horses, camels, goats and other common and exotic animals. We could stop and visit them. But she is not interested. “There,” she points to the sculpture at the top of the opera house steps, and grins. A perfect hiding spot. She skips up the steps and turns. Adult or kids’ book, what do you think?” She looks up at me, arms outstretched, a book wrapped in ribbons in each hand. A copy of Forrest Gump in one, DC Super Heroes Collection in the other. “Life is like a box of choc’lates …” I try my best Southern drawl and she chuckles. A young man sits near the sculpture she’s chosen for her hiding spot. Clearly, it bothers her. Her mum turns to look at me. “She doesn’t like people seeing her in the act.” She wrinkles her nose and nods in agreement. “I can be your human shield, if you want,” I offer. She beams in response, sliding the other book back in the bag, and sneakily positions the copy of Forrest Gump at the feet of local sculptor Otto Bänninger’s ‘Die Schreitende’ as I keep watch. When the deed is done, my eyes wander to the circus animals below and the mythical beasts towering over us from the roof of the opera house. And then, to the magical creature in the middle of this juxtaposition: Ellie, the Book Fairy. Although she is all but 10 years old, incidentally sharing a birthday with a certain Mr. William Shakespeare, she bustles with an energy and enthusiasm, for books and the Book Fairy project, that is wildly contagious. Earlier, while stuffing her face with pizza, she told me all about how she found out about the Book Fairies and the many places she had already hidden her treasures. And how it made her so happy to know that other people would find joy in the books she leaves for them. Her eyes light up in such a way that you can’t help but be drawn in to her world. Shaking my absent mind off, I ask, “Where to next?” She points to the lake promenade, which is only a short stroll away. As the sun sets, DC Super Heroes Collection gets dropped at the foot of a large maple tree. “I wonder who’s going to find this one,” Ellie muses. We look around for any potential takers, but people are hurrying past us to catch a tram or staring into their phones as they walk along the lake, oblivious to the carefully wrapped treasure nestled in a nook of the old tree’s roots. I smile. We live in such a fast-paced, news-inundated world, that it is easy to oversee the beautiful, small miracles that life throws in our direction. “Who knows?” I answer, secretly hoping Superman, Batman, Wonder Woman and Co. will be found before the next downpour. As we walk away, I see a young woman staring at the book out of the corner of my eye. Will she pick it up? Probably not. 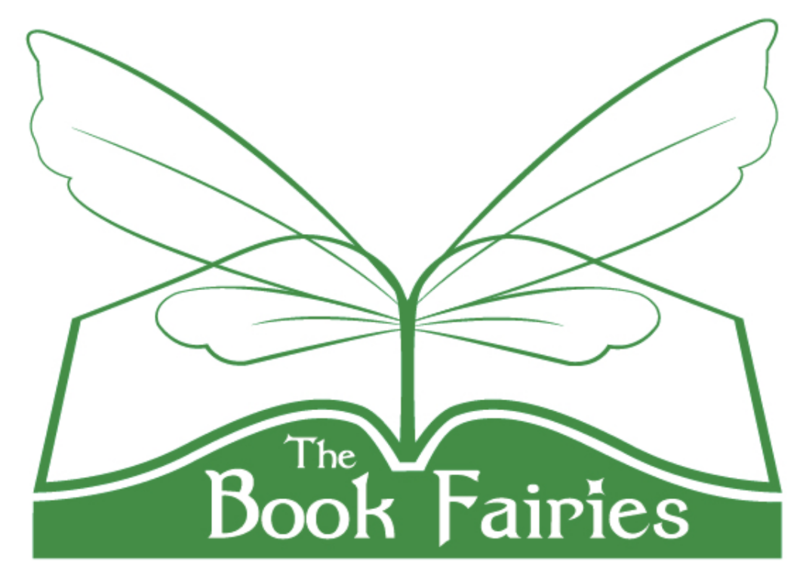 The Book Fairy concept is not very well known in this corner of the world yet. But I am hoping it will catch on. I am hoping that people will be more open to rediscover their sense of wonder. To walk out into the world less glued to their digital devices and more alert to the people and places around them. … watch with glittering eyes the whole world around you because the greatest secrets are always hidden in the most unlikely places. Those who don’t believe in magic will never find it. Sign up to The Woolf mailing list for news about new issues, writing competitions and upcoming writerly events.